When everything becomes more stressful, when everyone becomes busier, when the work piles up higher than the library’s coffered ceilings, everything becomes funnier. Suddenly breaking a pencil causes uproar of laughter and hilarity completely ensues on the dropping of a calculator. Layered extra large thermal shirts paired with knee socks and scrunchies are once again fashionable. And after all this tedious preparation, crammed memorization of useless information instantaneously forgotten, what do we do? We eat lunch. We treat ourselves as if we have undergone the worst possible treatment, generously removing time from our outrageously busy lives to enjoy ourselves, for once. Why do we only take special time to enjoy ourselves at the end of something, why don’t we just appreciate life as it goes and celebrate along the way? President Obama! It’s amazing to hear, amazing to say, amazing to read. The inauguration was incredible. The massive amount of people gathered to see Barack Hussein take his oath was astounding. I watched incredulously—so excited but unsure if this was actually happening. After years of waiting for 1.20.09, it was finally here, and this was truly happening! Watching racial barriers crumble before our eyes I sat with my fellow senior classmates and watched the twinkle in Yo Yo Ma’s eyes, the sparkle in Joe Biden’s smile, the overall pride of the Obama family. Democratic or Republican, Barack or Hillary, Religious or non-believer, gay or straight, rich or poor, righty or lefty—it didn’t matter, change occurred directly before us, proving that change IS possible and everything WILL get better. It wasn’t Obama’s first speech as president which brought tears to my eyes (although some may think this, as I left the inauguration assembly with smeary eyeliner patches around my eyes) but Aretha’s glorious singing. (I’ve seen her in concert—she’s not much better.) 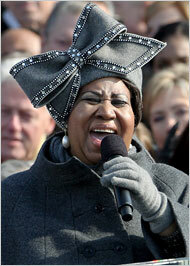 True, she was off key, and true, the hat made for excellent jokes for the rest of the week. But the power of her presence; the images of millions of people standing behind her, supporting Obama; the looks in people’s eyes, the smiles, the tears slowly dripping; the billions of flashes occurring every second to record this pivotal moment as best as possible, made me realize what a huge event this truly was. Our lives stopped for an hour to watch Obama take his oath (yes, I’m referring to the first time), we sat there; eyes open wide, ready for the revolution to ensue. And it did. It is. It will. But this is far from the end. Obama has a way to go before midterms and finals, and he has yet to earn even his first quarter grades. So we must encourage him—celebrate him as we do for ourselves after studying so tediously at the end of each semester. Everyday, we must remember what’s important, why we love our country, and how we want to change it. Send him letters, birthday cards, homemade cookies; remind him that we’re here. Let him know what we want. Tell him we love him. Repeat our necessity for change and improvement again and again and again.